The 1957 NBA World Championship Series was the championship series of the 1956 – 1957 National Basketball Association season, and was the conclusion of the 1957 NBA Playoffs. The best-of-seven series was played between the Western Conference champion St. Louis Hawks and the Eastern Conference champion Boston Celtics. This was Boston’s first trip to the NBA Finals in their franchise history as well as St. Louis’s. The Celtics won the series over the Hawks, 4-3. The 1959 NBA World Championship Series was the championship series of the 1958 – 1959 National Basketball Association season, and was the conclusion of the 1959 NBA Playoffs. The best-of-seven series was played between the Western Division champion Minneapolis Lakers and the Eastern Division champion Boston Celtics. The Boston Celtics swept the Lakers 4–0. The 1960 NBA World Championship Series was the championship round of the 1960 NBA Playoffs, which concluded the National Basketball Association 1959 – 1960 season. 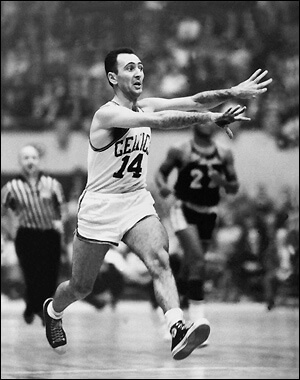 The best-of-seven series was played between the Western Conference champion St. Louis Hawks and the Eastern Conference champion Boston Celtics. It was Boston’s fourth trip to the NBA Finals and St. Louis’ third. The Celtics beat the Hawks 4-3.